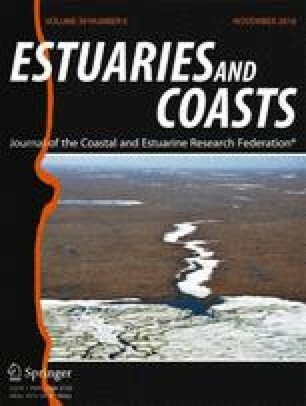 Oyster farming in estuaries and coastal lagoons frequently overlaps with the distribution of seagrass meadows, yet there are few studies on how this aquaculture practice affects seagrass physiology. We compared in situ nitrogen uptake and the productivity of Zostera marina shoots growing near off-bottom longlines and at a site not affected by oyster farming in San Quintín Bay, a coastal lagoon in Baja California, Mexico. We used benthic chambers to measure leaf NH4 + uptake capacities by pulse labeling with 15NH4 + and plant photosynthesis and respiration. The internal 15N resorption/recycling was measured in shoots 2 weeks after incubations. The natural isotopic composition of eelgrass tissues and vegetative descriptors were also examined. Plants growing at the oyster farming site showed a higher leaf NH4 + uptake rate (33.1 mmol NH4 + m−2 day−1) relative to those not exposed to oyster cultures (25.6 mmol NH4 + m−2 day−1). We calculated that an eelgrass meadow of 15–16 ha (which represents only about 3–4 % of the subtidal eelgrass meadow cover in the western arm of the lagoon) can potentially incorporate the total amount of NH4 + excreted by oysters (∼5.2 × 106 mmol NH4 + day−1). This highlights the potential of eelgrass to act as a natural biofilter for the NH4 + produced by oyster farming. Shoots exposed to oysters were more efficient in re-utilizing the internal 15N into the growth of new leaf tissues or to translocate it to belowground tissues. Photosynthetic rates were greater in shoots exposed to oysters, which is consistent with higher NH4 + uptake and less negative δ13C values. Vegetative production (shoot size, leaf growth) was also higher in these shoots. Aboveground/belowground biomass ratio was lower in eelgrass beds not directly influenced by oyster farms, likely related to the higher investment in belowground biomass to incorporate sedimentary nutrients. This research was funded by the National Council for Science and Technology (CONACYT, Mexico, project CB-2010-01-154376 awarded to VFCI). JMSG was supported by a postdoctoral grant from the Mexican Ministry of Public Education (SEP, PROMEP/103.5/13/5009). AA was supported by an Academic Mobility Grant provided by the Autonomous University of Baja California (UABC) and a postdoctoral fellowship from the Portuguese Foundation for Science and Technology (FCT, SFRH/BPD/91629/2012). We are especially grateful to Christine Harris (from the editorial team of the journal Ciencias Marinas) for her support during the revision of the manuscript, and to Julieta Hernández, Nevia Alfaro, M. Carmen Ávila-López and Eduardo Ortíz-Campos, Jesús Galarza (IIO-UABC) and the personnel from Ostrícola Nautilus for their technical support. Data of irradiance was kindly provided by Dr. Alejandro Cabello-Pasini.